San Ignacio Wreck: A Treasure Filled Florida Keys Diving Site? The San Ignacio wreck was one of the 1733 Spanish Treasure Fleet ships that went down during the night of the hurricane. Often considered a true treasure ship, this 292 ton British built vessel also has the least amount of information available. To clarify some rather gray areas about this ship, I spoke with the Florida Keys National Marine Sanctuary. They in turn decided additional research was warranted. They contacted known expert Dr. Roger Smith of the State of Florida Bureau of Archaeological Research for his comments. His final response was that as of yet, he could not 100% confirm the identity of this wreck. Realizing that these are the facts, the following information covers what is known about this vessel. It also includes information about the wreck site - which may or may not be that of the ill fated San Ignacio. We do know from manifests that she carried a handsome cargo of 12,000 pesos in silver and bullion. She also had on board 696 marcos, which translates to about 1,372 pounds of worked silver. We know that her official name was Sumey de San Ignacio, and that she carried onboard her owner Urquijo. He also owned the San Francisco which was traveling with the Flota. Perhaps if he'd chosen to travel onboard the San Francisco he would have lived through that dreadful night. Instead, out of the 52 people onboard, he became one of that night's 38 casualties. Forced west by the hard driving winds and powerful waves of the hurricane, this ship was pushed over Coffins Patch Reef. The initial impact almost gutted her, spewing out some of her cannon and anchors. As she was dragged and scraped across the mile of sharp jagged coral beneath her, she left a trail of silver, precious treasures, and bodies in her wake. Unlike the gruesomeness of that fateful night, today a visit to this wreck dive site is quite rewarding. There's always the possibility of finding a silver coin or other treasure, but this wreck is in protected waters as it lies within the Florida Keys National Marine Sanctuary. There is a very strict "look but don't touch policy" when it comes to these national treasures. The shallow depths, and the clear water at this wreck dive make it a great underwater photography site. 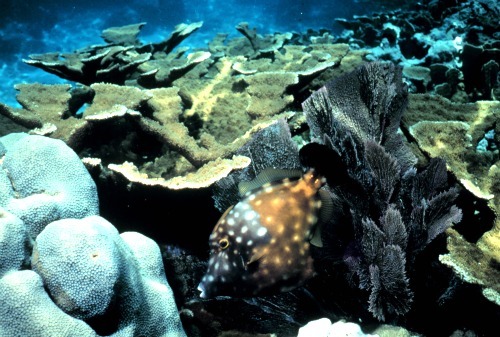 It's also the perfect spot for anyone Florida Keys snorkeling or for the novice diver. Not only can you explore this wreck, you're close enough to visit the Adelaide Baker. Plus Coffins Patch is comprised of 6 different reefs so if you're still in Marathon diving, plan on spending a second day at the quieter Coffins Patch dive site.